The tiniest murmur of tender delight. This breathtaking weave of prose and stunning artwork pulls at the heartstrings from start to finish. Following the seasons found in nature, the reader meets several animals that live near the family’s seaside home. The text is written in the form of a love letter from expectant parents to their new arrival. 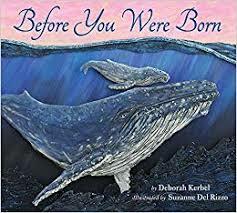 A young child would rejoice in the love that oozes from this book to know that s/he was, in fact, special, loved and greatly anticipated before s/he was even born. The only flaw in the text is the black text on some of the pages. It can be difficult to quickly find the text and keep an uninterrupted flow during a first-time read. This happens on pages where there is a vast array of colour. Specifically, this occurs on pages where the text is found within sunsets. Additionally, it occurs on the last page in the first line of text. During the first read, the text may seem slightly lost on these pages. But this minor detail is overshadowed because the text is briefly lost due to spectacular combinations of colours in the artwork meeting the reader’s view. Suzanne Del Rizzo illustrates each animal with immaculate detail and grace. Notably stunning, the mother whale with her young is striking both underwater and jumping above in the distance. Several of the animals look incredible life-like, such as the fawns hidden in the springtime leaves and even the hummingbird visiting a columbine on the dedication page. The artwork is done in a combination of polymer clay and acrylic wash. Not only are the animals displayed in great beauty, but so are the scenes in which they live, such as the forest of silver birches, fields of wildflowers, the calm waters reflecting the sunset and the mist resting on a fresh stream. Overall, an expectant couple will relate to the many feelings of anticipation and love as they read the velvety prose and feast upon the artwork. The final page reads, “A new family dawns in the glow of your birth” as the new family sits together watching the stillness of the sunset, clearly peaceful as they travel into their new stage of parenthood. These often-indescribable feelings are celebrated within this text and fully put into words what so many new parents are trying to explain. Beautifully, the changes in season also reflect the change coming soon for their family, yet it is not portrayed as negative or uncertain but instead shows how seasons of life come and go in unique beauty. Johanna Beaumont, a kindergarten teacher by profession and at heart, is currently away from the classroom taking care of her first newborn. She lives in Kenora, Ontario, but also studies for a Masters of Special Education via correspondence at UNBC.